We remained in Arizona eight months before we met Ted Kootzewatewa at a Summer Solstice gathering in Sedona. It appeared as if it was a chance meeting, although as stated numerous times in these writings, I have come to believe that nothing in our lives happens by chance. The night we met him, we had no idea that Ted was Hopi royalty. He later revealed that he was a two-horned priest by birth. That made him a high official on the reservation. As events unfolded that summer, we found ourselves personally involved in a most astounding set of circumstances, and personally involved in one of the tribe's most sacred prophetic beliefs. Ted made his living as an artist, doing most of his work with intricate sculpturing in alabaster. He also was married to a Caucasian woman, who seemed to be financially comfortable, at least from Hopi standards. She was a former superintendent of government schools on the Hopi reservation. They lived in a large ranch-style home just east of Flagstaff, at the edge of the Navajo Reservation and in the shadow of the San Francisco Mountains. That first meeting led to a strange relationship. Ted and his wife, Marjorie, returned a few days later for a visit. They arrived in her late model four-wheel-drive truck. It turned out they drove down from Flagstaff because Ted had some kind of business appointment in Sedona the following day. I don't recall if Ted asked, or if we offered, but he spent the night with us, while Marjorie returned to Flagstaff. While his hair was still black as coal, and his body as lean and fit as that of a young man, I suspect that Ted's appearance belied his age. Marjorie was a woman in her fifties. She used a cane and sometimes crutches to get around because she was suffering a late-life re-occurrence of polio. It was hard to imagine this intelligent, grand appearing older woman pared off with a strange and mysterious person like Ted. Ted was an enigma. His "business" in Sedona that day appeared to be with us since he did not leave the property until Marjorie arrived the following day to take him back to Flagstaff. Within minutes after entering our house, we were conscious of the intense nature of this man. His visit became a religious experience. Even a simple thing like eating a meal was turned into a ritual. A portion of the food on his plate was taken outside the house, blessed, and given to the animals. He was up early to welcome the sunrise. During the night, he led Doris on an out-of-body trip into the astral, where they talked about spiritual things. She still remembers that night although she cannot remember exactly what they talked about. The next day, Ted spent several hours with us, seated at the round oak table in the kitchen. He talked about spiritual things. At one point, he asked us to join hands around the table. Once united, he seemed to go into a trance. Strange words were coming out of his mouth. He told us we were unclean and that we needed to get our lives in order. 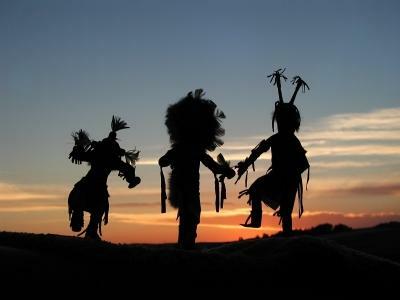 He explained that the work of a two-horned priest was preparing people for death, and that once they passed on, he picked up the body and ritualistically disposed of it in the Hopi way. In other words, he was the tribe mortician. Ted told us that he considered us a blood brother and sister, and promised to attend to our bodies after we no longer needed them. It was a spooky thing to be talking about. I was not sure if Ted was foreseeing our eminent death, or if he was just being kind. Ted was more at ease when he was in our yard, so we spent a good deal of our day on our patio. During our discussions I talked about Crowley's Book of the Law, and read him some of the important passages. He seemed fascinated by this book, and the great mind that created it. He was especially interested in some of the number and letter puzzles in the book, and devoted a lot of time mentally attempting to solve them. When they left us that afternoon, Ted and Marjorie invited us to their home. Ted promised us a tour of the Hopi reservation when we came. How could we resist? Within a week we were at the Kootzewatewa home, enjoying a mid-morning cup of coffee and cookies, and reviewing Ted's special studio filled with finished and partially completed paintings and sculptures of both wood and stone. His kachina figurines were exquisite. He pointed out that the difference between the Hopi dolls and the "imitations" produced by some of the neighboring tribes was that a Hopi kachina is carved from a single piece of wood. The others have the arms and sometimes the legs and heads glued in place. Ted's finest work was his alabaster sculptures. He seemed to have a magical touch, chipping away the many colors of alabaster into intricate shapes of people, animals, and religious symbols depicting the Hopi way of life. His work was so good I am sure he was paid well for anything he sold. He gave us a painting of a kachina dancer, which we proudly displayed on our wall as long as we lived in Sedona. Soon we were off on our promised tour of the reservation. Marjorie chose to stay behind because she said she did not feel she could handle the rigors of the trip. We drove straight into the Navajo Nation, then turned north on the paved road that took us straight to Kykotsmovi, a Hopi community on the tip of the second mesa. Although he said the family owned a house on the mesa, his mother and other members of his family lived in a government supplied house at the base of the mesa. We stopped at the house where we were introduced to the family. There we were treated to a strange mush made from ground Hopi corn. It tasted flat, about how I would think cardboard might taste, but was very filling. Ted said this was a basic staple for the Hopi men. They still took this kind of food, rolled in corn leaves, with them when they walked for miles each day to tend their gardens in the high desert surrounding the mesa. Ted only ate one meal each day. He explained that Hopi (and I suspect many other Indians) have different metabolisms than white people. They survive hard times because when food is plentiful, their bodies store the excess and then burn it during times of hunger. Even while active, if he dared eat more than that single meal, Ted said he would gain too much weight. During the tour we visited Ted's workshop on the reservation, where his kachina masks were stored. He had many different masks, used for different dances for different reasons throughout the year. Thus we discovered that we were in the company of not only a high priest, but a dancer. He took us on the winding road that led to the top of the Second Mesa and into the heart of Kykotsmovi. There we walked among the buildings, saw the sacred kiva where the elders of the village held their business meetings, and stood atop some of the flat roofed buildings, looking out over the flat lands for hundreds of miles. Ted showed us secret places. He pointed out a path through the town cemetery where he said there was a secret cave where Spider Woman, the Hopi version of Mother Earth, was believed to live. He took us to a small pool of water, high on the Third Mesa, where a terrible man-eating creature was said to live. Ted said there seemed to be no bottom to that particular pool, and that he personally knew of young boys who attempted to swim in the pool, were grabbed by the monster and pulled to their deaths. We visited Hotevilla, the village on the Third Mesa, which was a maze of plain, square, uninteresting looking houses. We stopped at a water tap, a single pipe coming out of the ground, which supplied water for the entire town. Nobody had running water in their homes. Water is an extremely precious commodity in the high desert. During our wanderings, we stopped at a public park to share a picnic lunch that Doris brought. It consisted of some pretty basic food that we could carry in a hot dry car. We ate peanut butter sandwiches, potato chips, cookies and drank bottled water. It was a great day, one of many memorable days we spent in the State of Arizona.